Tales From the Inner City is short story collection by the beloved artist Shaun Tan, where crocodiles live on the 87th floor, men turn into frogs, and snails fall in love. His world is our world slightly altered by small detail. Through Tan's unique imagination and breathtaking art, he investigates our deeply relational coexistence with animals. They occupy our imagination in fantastic and ordinary ways (just like his stories). I haven't been able to shake the otherworldly fugue I encountered in Tales from the Inner City and I think everyone will enjoy dipping their toes in Tan's stories. 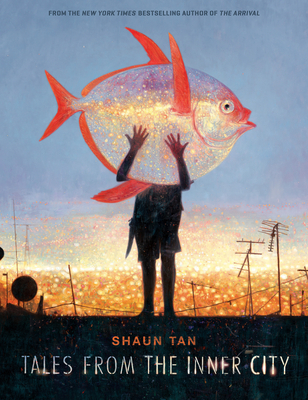 Shaun Tan is the New York Times bestselling author of The Arrival, Tales from Outer Suburbia, Tales from the Inner City, Rules of Summer, and The Singing Bones. He received the Astrid Lindgren Memorial Award in 2011 and won an Academy Award for the adaptation of his picture book The Lost Thing (from Lost & Found: Three by Shaun Tan). Shaun lives in Melbourne, Australia.